This month’s English class was full of fun times. Yoanna, the English teacher, started to teach the students from the new book she got for first grade English, which she managed to get from a friend. Yoanna started to print pages to use in teaching the students their first lesson for this course and now they are about finish the second lesson. In the beginning of the new course, there were only ten students but now there are fourteen students. This is happy news. Yoanna has been printing coloring pages related to the lesson presented each week, so the students enjoy the learning process and have fun in the class. The children especially like this because they go to school the whole week, and sometimes it's just too serious. Yoanna tries her best to make the lesson not like a school lesson but more of a time to learn and have fun by coloring, playing games, and laughing. This month was a busy month for our clinic. 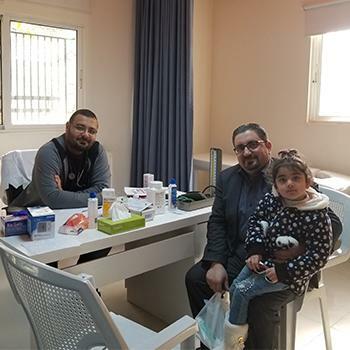 Dr. Fadi has seen about 136 Jordanian patients, twenty-four Syrian patients, and five Iraqi patients. They all live in Ma’daba and each was given the needed treatment. Some of them came more than once during the month as their health condition required that. Most conditions are general medical conditions and no surgical cases were seen. There is still a shortage of medications, and we are still facing the problem of a limited budget. This month, Dr. Karam continued to see patients of different nationalities, including Syrian, Iraqi, and Jordanian. An average of four to five patients are seen daily and they are of all age groups. Dr. Karam did extractions, filings, scaling, pulp extirpation, and one surgery to remove wisdom teeth. Assma is a 19-year-old from Syria who has been living in Jordan for six years. Her father has a disability and has a very low income so he cannot afford to take Assma to a private dental clinic. Thankfully, Assma and her family were able to receive the needed treatment in our dental clinic. In the mosaic class this month, the ladies have completed working on 11 mosaic plates, which included the N ن letter design and also the Moses' staff design. After Christmas and the New Year's holiday, the computer class is back and there are new students. This time, after several tests, we decided the ages that are accepted in our class are from eight to fourteen years. The result of this decision was reflective of the students and helped the teacher to focus better. It is an easy delivery of information to students. Also, besides teaching the students technical skills, we are also working with them on having correct behaviors and attitudes while they are inside the class. In addition to that, Laith, the teacher, is in continuous communication with the students’ parents to follow up, build trust, and have a good relationship. Now, we have a new waiting list for the next course. There are many families who wish to send their children to our center for the activities, classes, and program we provide and give. The ladies in the sewing class are happy and doing good as they are learning fast and improving. They learned how to fix clothing and fabric designs, and now they are able to make designs and sew clothes after only a week of training.